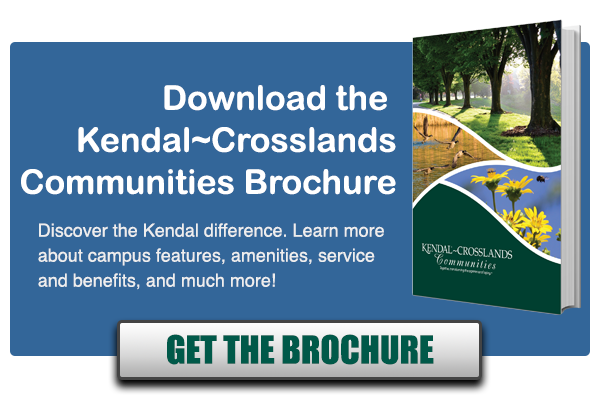 Raquel Holcomb, the Vitalize 360 coordinator for Kendal-Crosslands, sees a lot of what she does as helping to personalize the Kendal-Crosslands experience for residents and help them connect to the many services and programs available. “Each resident has different things that come up, and with all of the resources we have available, we can find the right solution, and sometimes, it even leads to new programs to address issues,” Raquel said. For example, after Judy joined the community, she decided to try Vitalize 360. Raquel came to her home, and they filled out a survey and got to know each other. Through the process and a few visits, Raquel learned that Judy was having trouble sleeping at night, something many older people struggle with from time to time. Judy said she just felt like she was always thinking and processing what happened during the day, and it was hard to shut that off at the end of the day. Raquel and Judy looked into solutions together, that included getting Judy evaluated for possible sleep apnea, and looking for a way to help her relax and quiet her mind before bed, making it easier to fall asleep and sleep well. Judy decided to replace her mattress and Raquel helped coordinate choosing one that would work for her. Judy also began using the Calm app on her smart phone, which has a 10 minute program that helps people unwind, to help her relax before bed, She’s now been using now for over 120 days, and Judy couldn’t be happier with her progress over time! She’s sleeping better and feeling better, which helps with almost every other aspect of her life as well. Based on Judy’s success, Raquel is working with several other residents who have similar issues,so the solutions that worked for Judy are now also helping other residents across the community. They have even arranged for a local expert in sleep to come give a presentation to the community, helping everyone learn about better sleep. Through the Vitalize 360 program, Raquel got to know Judy and build a relationship that allowed them to develop an individualized program to help Judy, but in the process, the resources they discovered are really helping the whole community! Setting individual goals can be almost anything that’s important to a resident. For another resident, his goal was to dance with his granddaughter at her upcoming wedding, but he was currently using a walker for mobility. Raquel helped coordinate a program with the physical therapists and trainers to improve his fitness and stamina over an eight-week period so he could stand, and using his granddaughter for support, dance with her for 2-3 minutes- a family memory that is simply priceless. “By talking to residents and helping them set goals, we can help them stay motivated and engaged to get everything they want to out of life, and their experience here at Kendal-Crosslands Communities. Knowing what’s happening in their lives means we can be proactive to head off any problems, and connect them to the right resource that can make things so much easier for people,” Raquel continued. The individualized approach of Vitalize 360 means every resident’s experience is a little different. Raquel says that her job is a little bit like being a care coordinator, but it’s about so much more than just medical or physical needs. It’s a whole-person approach, that gives each resident the ability to live their best life. Vitalize 360 is just one of the many aspects of Kendal-Crosslands Communities that helps transform the experience of aging for our residents. If you’d like to learn more about Vitalize 360 or other aspects of our wellness programs, please be sure to fill out the form below and subscribe to our newsletter.